Click on any of the below photos to see the photo full size. This trip was a graduation present for Erik. He had graduated from Mid America Funeral Collage. We left Indy about 8 PM on Thursday Sept 24th. Doug drove all night Wed. to New Orleans and Erik mostly slept. Our first stop was at Ft. Pike just west of the city about 9 AM. It was time for a cold one. We walked to the water and dipped our toes in. The sun was hot and the day was beautiful. Ft. Pike was built to protect the access to New Orleans through lake Pontchartrain. Named for General Zebulon Pike the fort was completed in 1821. This fort was heavily used during the Civil War. The Front Entrance to the Fort. There is a moat on two sides of the fort, the front and south sides. Erik is sitting on the cannon to the left. Just inside the entrance this is the view of the courtyard. Erik standing on the top of the north wall. A good view of the center keep and coutyard. A view of the top of the front wall. Note the curved cannon placements. Stairs on both sides to the courtyard. A view of the outter wall and the bridge used to access the island where the fort is. Note the pivot pin used to swival the cannon in the foreground. A complete view of the outter wall. Bridge still on the background. Erik inside the outer wall gun placements. The opening for the cannon is just below Erik's raised arm. Second picture of Erik inside the outer wall gun placements. Doug at the opening for the outer wall cannon placement. Erik at the inner keep. Note the different color bricks used when new sections were added. Used for Officer quarters. After leaving Ft. Pike we drove to the French Quarter. We had reservations at the Bourbon Orleans. This hotel building was build for a convent in the early 1700's. It sits just behind the Cathedrel of St. Louis. We had a bit of trouble with our room. I had made a reservation for a room with double queen beds. I was told they did not have any double queen rooms but did have a double single bed room on the 4th floor. We went up to our room to unpack and get some rest. Low and behold there was lots of noise in the room above us. I called the fromt dest to find out what was going on. I was told they were doing construction and should be done by 4 PM or so. Lordy, I needed some sleep. I went down to inquire about a different room away from the construction and was given a room on the second floor. But the room was a single queen room they told me they would put roll-a-bed in. The room was so small I could not even get the baggage cart into it. I had a small stroke at this point. After calming down and spoke the the hotel manager, who kindly upgraded us to a Suite on the 3rd and 4th floor. Cool! It even had french doors to the balcony, but they wouldn't open. The was no excaping the construction noise, but I was so tired I managed about an hour of sleep while Erik explored the hotel. After a quick shower and a beer, we were out for dinner and a walk about. 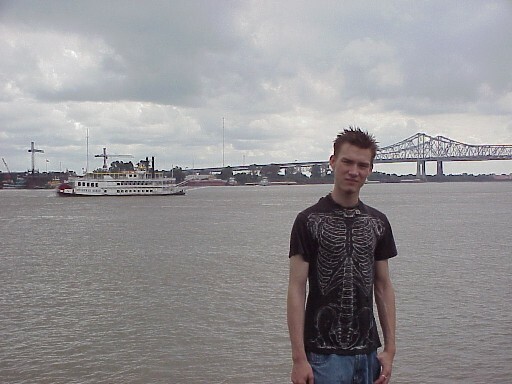 Erik on the levee by Jackson Square. He's having a good time, he just doesn't like to show it. Later that evening after dinner at the Creole Kitchen. 2 plates of Jambalaya please! Bourbon Street just after dark. Erik looking cool, digging the chicks. We did not stay out too late Thursday night, 11 or so. We were too tired after walking for about 4 hours. Not to mention the brewskis. Erik was asleep before I was. Friday morning I awoke promptly at 6 AM by the lovely sounds of drilling through concrete. The sound of the drilling was overshadowed by Erik's snoring. I took a shower and headed down for more ice to chill the evening's nectar. I had a breakfast of eggs and bacon at the hotel restaurant. Walked to Jackson square (short walk) to sit in the sun and read the paper. I checked out the daily side show in front of the cathedral. One guy covered in chains in a straight jacket trying to escape. He had quite a crowd for so early in the morning. Went back to the hotel about 9 and found Erik still asleep on the couch, fully clothed as usual. Construction noises going full tilt. This kid can sleep through anything! I got him up, called for the car. Loaded up the beer and the map and off we go to see some plantations. First stop was the San Francisco Plantation. San Francisco Plantation sits in a stately manner on the east bank of the Great Mississippi River less than 40 minutes from New Orleans near the small historic town of Garyville, in St. John the Baptist Parish. The home was built by Edmond Bozonier Marmillion and was nicknamed St. Frusquin. a name derived from the French slang term, sans Fruscins, meaning "without a penny in my pocket", a reference to its high cost. It is a galleried house in the Creole open suite-style. The house is nestled under centuries old Live Oaks and houses one of the finest antique collections in the country. In 1870 Achille D. Bougere purchased the plantation and gave it the name of San Francisco. A 2 million-dollar restoration was completed in 1977. During the restoration the house was painstakingly restored to its original splendor, making it the only authentically restored plantation house in Louisiana. It features five artistically hand painted ceilings, faux marbling, and faux wood graining throughout and antique furniture by master craftsman John Henry Belter. This is the back side of the San Francisco Plantation. I did not get a good picture of the Front of the house. The river was several hundred feet from the house when it was built. Now it is about 50 feet. The river road is directly in front of the house. Before the river shifted there were elaborate gardens that stretched to the edge of the river. This is one of the original slave cabins. At it's height this plantation had about 100 slaves and the cabins lined a road from the back of the house for a half mile. Taken before the tour of the house. Erik inside of a slave cabin. On the wall behind him is a roster of salves and the pice paid for them. This really made the reality of the times sink in. Taken before the tour of the house. Dad and Son on same said porch. Picture taken through the window of the men's drawing room. The room was elaborately hand painted. All the doors and woodwork upstairs was painted in a faux finish to look like a variety of woods. Detail of the door to the men's drawing room. Interior of the ladies drawing room. The upstairs was the main living area of the house except for the dining room. Erik on the side of the house. The pipe coming off the house above him funneled the rain water from the roof to the water cisterns. This house had running water in two downstairs rooms, with a shower, at the time it was built. St. Johns is the parish directly across the river from the San Francisco Plantation. Most of the family was buried there. This was a sugar cane plantation. The downstairs floor is brick, laid directly on the soil so that when the river overflowed the water could seep through the brick back down into the ground. The walls were 16 inches of brick, plastered over. All the floors, beams and trim in the house are original and made from Cyprus. The house when built was all white as was the custom. The man who built the hose died less than 2 years after completion. The large silos on the side of the hose are water cisterns. They collected rain water from the roof. Using gravity feed they had running water in the house in the rooms on the bottom floors. One of the sons married a German woman who undertook the interior and exterior painting of the home. Some of the second floor paintings can be seen in the few of the attached pictures. In one of the pictures Erik is standing next to a list on the wall, outlining the slaves, names and ages and what was paid for them. Some cost as little as $25, others several thousand. In the 1800 $2 thousand dollars was an huge amount. At it's height they had over a hundred slaves working on this plantation. At the time the house was built they had elaborate gardens stretching over a quarter of a mile to the river. Now the river road sits less than 30 feet from the house with the levee right next to it. I had lunch at a small restaurant just on the north side of the plantation. It was breakfast for Erik. I can't remember the name but the food was excellent! Bread pudding for desert. So, From lunch by the San Francisco Plantation my intent was to go to Nottoway Plantation, across the river and some way to the north. After going over the Mississippi and heading north, we passed the Laura and Oak Alley Plantations. It's still early enough, we may be able to see all of them, I'm thinking. Nottoway should be 30-45 minutes further up the road. Erik, now fully working on digesting his lunch has fallen asleep again. I'm rocking out on Mellencamp's new album, Trouble No More, and Erik is snoring. My navigator is out of commission.... Somewhere along the line it dawns on me I have been driving way, way too long. I stop at a gas station in some little town that smells like boiled shrimp. In fact on the corner they are doing just that. There is a cop car in the lot and as I get out here he comes. So I stop him and ask for directions. He proceeds to tell me we have gone way to far, missed the turn off. But with his very heavy black southern accent I cant make heads or tails of the directions he gives me to get to Nottoway. Hell, I at least can backtrack and find Oak Alley. I wake Erik up as we pull into Oak Alley. 2 hours wasted driving! Crap City, I need a beer. Before heading into the plantation I have one. Just one. The sun was out and it was hot, hot, hot. It must have been close to 95. Oak Ally is spectacular and NOT to be missed when in New Orleans. Erik standing at the rear of Oak Ally. A view across the front porch. Erik sitting in a chair looking at the trees. Second view of the front porch. Doug striking a pose amongst the trees. Erik checking out the ally of oaks. The river levee in the far background. A front view of Oak Ally. Erik thinking of taking a bath in the kettle used to boil down the sugar cane. Closeup of the sugar cane kettle. A side view of the mansion. Interior shot of the family sitting room. A close up of the roots of one of the largest trees in the ally. A few more trees for good measure. Nice closeup prifle of Erik. What a good lookin' kid! Doug in the car driving out of Oak Alley. Erik in the car driving out of Oak Alley. A view of the sugar cane growing on the plantation grounds, same as 200 years ago. On the way out, we stopped in front on the levee for another photo op. Erik on the levee. The amous Ally of Oaks viewed from the road. Standing on the levee a panoramic shot of the mighty Miss. as the storm front passes over. A spooky picture of the front of the plantation house. Note the ghost on the front path! Jacques Joseph Roman, the first known member of the Roman family in Louisiana. A native of Grenoble, France, it is thought that he came to Louisiana to administer the affairs of his noble cousin, Joseph Paris du Vernay, who had been granted a large concession of land up-river from New Orleans. Jacques Joseph's presence in the Colony is mentioned in 1728 when difficulties between him and the concession managers were brought before the Colony's governing council. In 1741 Jacques Joseph Roman married Marie D'Aigle, whose family had moved from Canada, and spent much of the first years of their marriage buying and selling plantations. Of their five children only one son, Jacques Etienne, and his two sisters survived to inherit a sizeable estate. At the age of 29 Jacques Etienne married Marie Louise Patin, who enthusiastically presented him with a large family. The youngest, Jacques Telesphore, and the 19th century arrived together and found a colony whose fortune was flourishing, due in great part to successes in the field of sugar planting. Sugar quickly became the major crop along the Mississippi as far north as Baton Rouge. Louisiana, meanwhile, had become a ping pong ball on the political table of Spain and France. In a few short weeks it bounced from the Spanish flag, where it had been since the transfer from French hands by secret treaty in 1763, to the French Tri-Color, to the Stars and Stripes where it remained, achieving statehood in 1812. However, in the brief 3 weeks of the post-revolution French regime (November 30 - December 20, 1803), the Napoleonic Code was introduced, establishing a precedent that would remain and create a legal system in Louisiana distinct from the rest of the Nation. The word Creole is a derivative of the Spanish Criollo, meaning native born, and was used to denote children of European parentage born in the New World. French Creoles, such as the Romans, viewed their new countrymen with disdain, claiming they had no refinement at all, and withdrew into New Orleans' Vieux Carre (or Old Square) where the French language and old ways prevailed. However, as more and more Americans poured into the area a compromise became inevitable and the cultures began to slowly merge, producing an almost imperceptible, but quite irreversible, trend toward social change. As the Roman children grew up and married, the family achieved more prominence as leaders of society, and their activities alternated between their plantations in St. James Parish, large cattle lands in St. Landry Parish, and elegant dwellings in New Orleans. Among the latter, was the house now known as Madame John's Legacy on Rue Dumaine, which was purchased by Jacques Etienne's widow for her and her bachelor sons shortly after her husband's death. From here, Jacques Telesphore Roman began his courtship of Celina Pilie, whose very prominent family lived around the corner on Rue Royal. They were married in June, 1834. Records show that on May 19, 1836, an act of sale before Judge Louis M. Taney transferred ownership of Oak Alley Plantation from Valcour Aime, who had purchased it in 1820, to his brother-in-law, J.T. Roman. This transaction was conditioned so that Valcour Aime would acquire the nearby Roman family estate in exchange for Oak Alley plus cancellation of a bank debt. After a long tour of the grounds and house of Oak Alley, a storm was blowing in and we went down the road to the Laura plantation. We got there just as it was closing and the storm was directly overhead. It was not raining all that much but the lightning was spectacular. Erik and I walked around the outside of the plantation house and took some pictures and then headed to the car when the rain started to pour from the sky. The front of Laura Plantation. I love the colors. Side View from the parking lot of the Grandmothers house. It is starting to fall down. Erik sitting on a bench at the back veranda. Detail of the wall by where Erik was sitting. The backyard viewed from the house. Side view of house and cistern. A very cool picture from the bottom of a train track crossing the Mississippi. We drove the long way back to the city after the plantation tour, driving through the Garden District on the way back to the hotel. Friday night was a beautiful night in the city; we had dinner at Bubba Gump's if I remember right. We had many beers, and did a little shopping. We had many trips up and down Bourbon Street, stopping by the hotel from time to time to offload and grab more beer! I collected a few beads over the evening. We met many interesting folks from all over the country. We called it a night about 2:30, but the street party was going strong. Back from the plantation tour, Erik gets ready to party. Erik dressed up for the night. The rubber ducks were bought from a shop, and Erik liked to squeak them as he walked. He was wearing contacts with lines in them that really freaked people out when they looked at him. This did get him into many conversations with girls his age. Erik, dressed as he was did not stand out in the crowd. They were many dressed like him and worse. Saturday morning was warm and partly cloudy. I was again up Early and Erik got his beauty rest. I had breakfast at a restaurant on the south side of Jackson Square. Walked around and took a few pictures. I went back and woke Erik up and we walked Jackson Square and the French Quarter again admiring the paintings and the goings on. 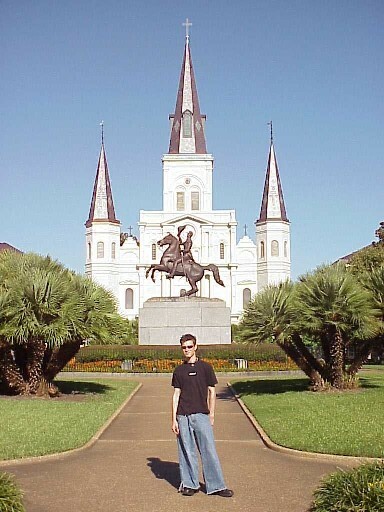 (See picture Jackson Square3, this is my favorite) We went to the Museum of Art about 11. The museum was getting ready for a major Egyptian exhibit to start in the middle of this month. They had some very cool Faberge eggs and jewelry. The museum had many great pictures by Warhol, Renoir, Monet. They also had a huge collection of Pre-Columbian pottery, sculpture and artifacts from North and South America. I wish I could have taken pictures of some of it. They had lots of historical paintings from the early period of the city. An early morning picture of the cannon across from Jackson Square, on the levee. Jackson Square and Cathedral, picture taken from in front of the cannon. The New Orleans Museum of Art. Very nice. Close up of Erik by the moving sculptue infront of the museum..
Erik taken late Saturday afternoon while out shopping and seeing the sights. Hey, buddy! Wanna' buy a coat? After the Meuseum of Art we drove back to the quarter and had lunch in a cafe by the hotel. We walked around more after lunch. We went through many antiqe stores. The last picture attached is one Erik took of a street bum trying to sell me some coats he "found". I took a nap late in the afternoon to be prepared for a long evening. We had Dinner at the Oyster bar on Bourbon Street. The seafood gumbo was most tasty, Erik had alligator tail. Saturday, we partied long into the night, burning the candle at both ends. Erik passed out about 2. I went for a couple more trips down Bourbon Street and called it a morning about 4:30. Sunday was a day of rest, Shopping and Tattoo's! Sunday morning I was up by 8 and went over to Jackson Square and had breakfast by myself in a little cafe by the cathedral. sat in the square and read most of the paper. Sunday night was going to be exciting as the Colts were in town to play the Saints. I rousted Erik out of bead about 10 and off we went to the Garden District. Erik wanted to get a Tattoo of his own design. He also wanted to find the recording studio for Nine Inch Nails. We found a tattoo parlor 3 blocks from the NIN studio and he proceeded to get a new tat. This was done at Crescent City Tattoo. The new Tat turned out well. It is a "Y" with a "?" wrapped around it. It took about an hour to get done. Erik cried like a baby during the tat application! No, not really! hehehe. There was no drinking involved before the Tat application! I swear. Alice gave him the tattoo. In the photos she looks quite manish. There was another guy there that gave piercing, his name was Cornbread! Quite the fellow. If you look closely at picture Tatoo2, you will see Cornbread in the mirror. I declined the offer to get my own Tat. After that we found the NIN studio and stopped for a photo op. Trent Reznor of Nine Inch Nails is Erik's favorite. Erik in front of Crecent City Tatoo. This picture was actually taken after he got his tattoo. Alice applying the tatto pattern. The other guy who worked there that did body piercing was named "Cornbread" He can be seen in the mirror. Centering and reapplying the pattern. The pain begins. Oh' it hurts so good! Erik gains a Zen like trance during the application. The outline is almost complete. Filling in the black. It was I that suggested that Erik make this a 2 color tattoo. He picked "Cherry Red". Alice is a study in concentration. "I'm glad that's over!" Alice cleans up the mess. A closeup of the final product. Erik was very pleased. Erik in front of Trent Reznor's Nine Inch Nails recording studio. The street sign in front of the studio. Erik wanted this picture. Why? Ask him. Erik in the French Market at the hot sauce display. One of my favorite pictures! We drove around the Garden district for awhile and then headed back to the French Quarter. We did allot of shopping Later in the afternoon at the French market. Bought some stuff for the girls. Had to buy some hot sauce! You can not believe the names on some of them. Monday was a short day. We got up early and finished packing. Showered and out to breakfast at a the Café DuMonde. It was a beautiful morning. We did a bit more shopping. I bought Erik a cool Black T-shirt that had skeletons on it and a Jazz Funeral logo on it. Very appropriate. We took a few more pictures at Jackson Square and went back to the hotel and checked out. Erik prepareing his coffee and begnets at the back of the cafe. No coffee for me, I stick to OJ. There are 4 begnets (fried dough) in one order and a quarter pound of powdered sugar. The front of the cafe looking along the Jackson square. Our last look at the river, just after breakfast. Looking north twords downtown. A closeup of the docked riverboat. Erik standing in front of the statue of General Jackson, the hero of the Battle of New Orleans. A picture fit for a post card. The best picture of the trip! Erik close up on the square. 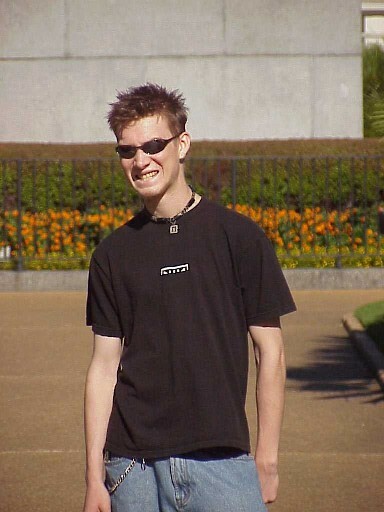 A shot of Erik while walking on Royal St. I have a head ache, but I'm not sure why! We drove to the Garden district again to try to locate Trent Reznor's house. We found the area but were unsure of the exact house. We walked through the Lafayette Cemetery. We went to the Confederate Memorial Hall and checked out the Civil War history and displays. We had lunch at the Voodoo Barbeque restaurant. I ordered Erik ribs and Gris-gris. I did not know what it was but wanted to try it. It was a green vegetable with meat in a very tasty sauce. Doug in the Garden District. Erik on the steps of the museum. The building itself was built by the Confederate Veterans. Erik inside the Confederate Memorial Hall. Then on the Road back home about 2:15 in the afternoon. The dive back was uneventful and was made easier as Erik helped share the drive. He practiced driving no handed. (See picture) There was lots of construction on the drive, naturally. We saw a lot of this on the way back. A lot of that too! Are we home yet? Hey, whats that smell? When we left it was in the mid 80's and sunny. We rolled into the driveway at home at 4 AM Tuesday morning. Erik fell asleep in Southern Indiana and I like to never got him out of the car to go into the house. It was good to be home, but damn, it was cold. When we got home it was in the upper 30's.